Looking for a new protein powder to add to your diet? Grass fed whey might be the answer for you. As one of the most natural protein supplements, grass fed whey can help boost any healthy eaters protein consumption. Grass fed whey protein comes from cows that eat a strictly grass fed diet. One of the healthiest protein supplements around, grass fed whey is a great addition to any diet. Don’t believe us? Read these 8 reasons why you should try grass fed whey. Grass fed whey protein is 100% natural. Grass-fed cows are never fed any genetically modified organisms, and are not exposed to growth hormone treatment (rBGH & rBST), chemicals, antibiotics, or injected pathogens. This makes grass fed whey one of the healthiest protein supplements to include in your diet. It is free of hormones, antibiotics, pesticides, and steroids. Reach your weight loss goals quicker! This whey protein contains much higher levels of the fatty acid, conjugated linoleic acid (CLA), than non-grass fed whey. CLA may improve muscle growth and increase metabolism, both of which can contribute to weight loss. Muscle recovery may be easier. After a long workout there is nothing more rewarding than a protein smoothie. 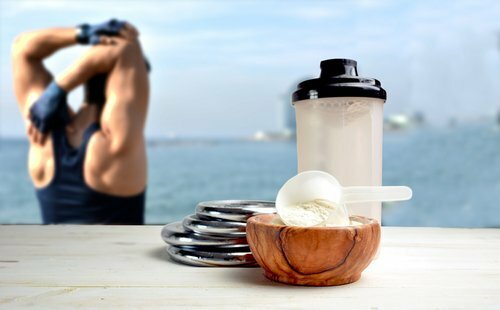 Consuming a grass fed whey protein smoothie within 30 minutes of working out may help repair and recover the muscle tissue that break down during strength training and other endurance workouts. Strengthen your immune system. Whey protein sourced from grass fed cows is also higher in the immune factors, antibodies, Lactoferrin and Serum Albumin, than whey protein sourced from non-grass fed cows. Antibodies, are proteins found in raw milk that fight off viruses and bacteria in your body. Lactoferrin helps regulate cell’s iron levels in your body to prevent iron deficiency and diseases such as anemia. Lastly, Albumin is a protein that provides nutrients and hormones needed for tissue growth and repair. Make sure to try a grass fed whey smoothie before your next cold. Grass fed whey is full of omega 3s. The inclusion of omega 3s in this protein supplement may help prevent diet related illnesses. Reduce your hunger pains. The macro-nutrient composition of whey protein makes it more filling than those of soy and casein proteins. Due to this, one serving of Naturade Grass Fed Whey provides 20 grams of protein and is only 150 calories. It may leave you feeling full longer and prevent you from cutting calories out of your diet. Embrace the non-GMO protein. Whey protein sourced from grass fed cows are free of Genetically Modified Organisms (GMOs). This means the cows never consume any GMOs and protein derived from these cows is non-GMO. Stick to a healthy diet with the help of this whey protein. So many nutrients, so little time. Grass fed cows consume a higher quantity of nutrients such as magnesium and calcium than grain fed cows. The nutrients consumed by these cows will be transferred into this protein supplement. Keep a nutrient rich diet with the addition of grass fed protein. While protein supplements may not be for everyone, grass fed whey has numerous benefits for anyone willing to try it. This entry was posted in Articles, Health Tips, Healthy Living, Protein intake, Weight Loss and Dieting and tagged grass fed cows, grass fed whey, grass fed whey protein, Health Tips, healthy, high protein, meal replacements, Naturade, naturade protein powders, naturadelife, Protein, protein shakes, weight loss tips, weightloss, whey protein.